5: percentage of Americans suffering from such severe mental illness that it interferes with day-to-day school, work or family. 23 vs. 16 percent: Percentage of women, more likely to be diagnosed with mental illness versus men. About 11.4 million adult Americans suffered from severe mental illness in the past year and 8.7 million adults contemplated serious thoughts of suicide. Of the 11.4 million, 2 million made suicide plans and about 1 million attempted suicide. Nearly 2 million teens, or 8 percent of the adolescent population, experienced a major depressive episode in the past year. 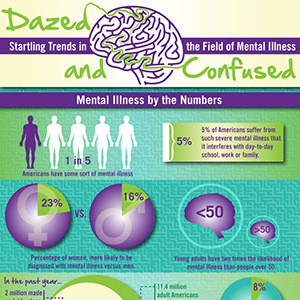 WOW: Only about 60 percent of people with mental illness get treatment each year. Think we’re alone? : 450 million people worldwide suffer from mental illnesses. Suicide is the third leading cause of death in youth ages 15 to 24. Over 90 percent of children and adolescents who commit suicide have a mental disorder. Youth with unidentified and untreated mental disorders also tragically end up in jails and prisons. 44% of students in counseling have severe psychological disorders, up from 16% in 2000. At the same time, 24% are on psychiatric medication, up from 17% a decade ago. Of the 133 student suicides reported from 320 institutions in 2009, less than half had sought help on campus. 16 percent of prison and jail inmates are seriously mentally ill, roughly 320,000 people. This year, there are about 100,000 psychiatric beds in public and private hospitals. That means there are more than 3 times as many seriously mentally ill people in jails and prisons than in hospitals. 2009-2010: Due to the recession, states cut $.35 billion in mental health funding. That leaves 43,000 beds in psychiatric institutions, or 1 bed per 100,000 people, the same ratio as in 1850. In 2010, around 7 million people in the U.S. were “non-medical” users of prescription drugs. This amounts to about 2.7% of the total population. Estimates of the number of people who have used a prescription drug for a non-medical use are even higher and range to up to 20% of the population. Painkillers: Opioids such as codeine and morphine are narcotics prescribed to treat pain. Other drugs in this class include oxycodone, Vicodin and Demerol. CNS depressants/tranquilizers: used to treat anxiety disorders and sometimes for the short-term treatment of insomnia. Barbiturates: Barbiturates are also central nervous system depressants prescribed to treat insomnia, tension, and anxiety. Stimulants: Stimulants are sometimes prescribed to treat attention deficit disorder. Dextromethorphan (DMX): DMX is the active cough suppressant found in cough and cold medications. MORE mental health and addiction treatment programs incorporate nutrition education and other nutritional programs in their treatment of mental illness and addiction. MORE psychotherapists incorporating treatment methods and techniques that have been shown to work (such as Cognitive Behavioral Therapy, Dialectical Behavioral Therapy, Motivational Interviewing, etc.). MORE faith-based future-therapists entering university programs. Leading to an increase (by educators, administrators, legislators) in tolerance, acceptance, and encouragement. WoW: Nearly three-fourths of Americans say their whole approach to life is based on religion. But only 32 percent of psychiatrists, 33 percent of clinical psychologists and 46 percent of clinical social workers feel the same. Understanding that personality differences are not mental illnesses. MORE people in need accessing appropriate treatment. Although the Internet and other communication technologies have made it easier for people to get help, there is still some lag-time due to finance and insurance issues, education issues, and simply trial and error. Controversy: Could better mental health care prevent some mass murderer? Alleged mass murders Aaron Alexis (Washington D.C. Navy yard), Adam Lanza (Newton, Conn.), James Holmes (the theater shooting in Colorado)…could their alleged crimes have been prevented through mental health screening? The belief that admission to psychiatric inpatient treatment should be easier and that lengths of stay should be longer is also highly controversial. Do people generally benefit more from longer or shorter inpatient treatment? Would more admissions and longer length of stay really result in reduced incidence of murders by people with severe mental illness?